Note: This review was written for the website of the Charles Daniels Society: www.charles-daniels-society.org.uk, hence the greater focus than usual on the merits of the tenor soloist. 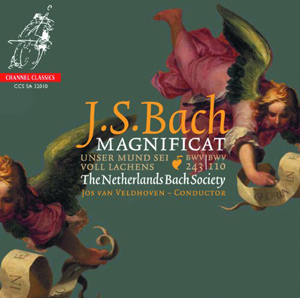 Bach's Magnificat gets a warm and friendly reading from Jos van Veldhoven and the Netherlands Bach Society. Nothing here is very strident or angular, and even though the orchestra is relatively large, it always functions to support the singers rather than compete with them. There is something agreeably messy about the textures van Veldhoven derives from Bach's scores. Everything is precise in terms of intonation and ensemble, but it doesn't feel too clean or pedantic. His Bach is closer to Sigiswald Kuijken than it is to Masaaki Suzuki, so there is not as much drama here as you'll find in other Magnificat recordings, but it is all agreeably easy on the ear. One point of pedantry that does creep in is the absolute loyalty to the liturgical calender and to liturgical performance practice. So the Christmas cantata "Unser Mund sei voll Lachens" BWV 110 appears before the Magnificat in order to conform to the liturgical calender and despite the fact that the Magnificat is clearly the main work on the disc. Similarly, a number of short pieces are interpolated into the Magnificat, apparently because this is what would have happened at St. Thomas's. Jos van Veldhoven uses this as an opportunity (or excuse?) to record some little-known 17th century Dutch choral music for the occasion. Charles Daniels takes the tenor part in a competent and varied line-up of soloists. The two sopranos Dorothee Mields and Johannette Zomer have the clearest tonal definition. Countertenor William Towers is very much like Daniels in tone, and in their one duet "Et misericordia" (track 15) in the Magnificat, they almost sound as one. Stephan MacLeod has plenty of energy for the various bass solos, but needs more power in the lower register, and more punch in his show-stopping aria "Wachet auf" (track 6) near the end of the cantata. To my ear, much of this music would benefit from being performed a shade faster, and if Daniels sometimes sounds like he is struggling to shape his long phrases, I'm more inclined to blame the conductor than him. He has four solo turns, one aria and one duet in each work. The first "Ihr Gedanken und ihr Sinnen" is a solo aria supported by two obbligato flutes. This is a great platform for Daniels to demonstrate the subtlety of his Bach reading. The flutes and continuo are soft and mellow, and so is he for most of this movement. He puts slight swoops in between some of the notes to increase the legato, a technique I'm not usually keen on, but his discretion here always keeps it tasteful. "Ehre sei Gott in der Hohe" (track 5) is a duet with soprano Dorothee Mields. Both the music itself, and the fact that the top line is sung by a women, ensure that the two voices are always easily distinguishable. But despite the clear difference in sound quality between the two singers, their musical qualities are almost exactly the same. The way the two singers shape the phrases with very slight dynamic swells and their legato in the melisma lines is almost identical. A triumph of ensemble singing for all involved. Daniels' solo contributions to the Magnificat are sadly all too brief. He sings the duet "Et misericordia" (track 15) with countertenor William Towers, but the close tessitura here (and presumably the shared musical values), make the two singers virtually indistinguishable. But then at track 18 we find a tenor aria "Deposuit potentes", which should be a real treat, albeit a short one, for Charles Daniels fans. This is one of the few overtly dramatic movements in the work, and Daniels really makes the most of it. Again, if it were a shade faster it might pack more of a punch, but even so, the singing really brings out everything the vocal line has to offer. "He has put down the mighty from their seats of power..." goes the words, and Daniels really gives us a sense of that applied force. Much of this short aria is descending melismatic phrases, and the challenge is to articulate the fast accented rhythm without the benefit of consonants on each of the downbeats. He manages brilliantly, but with no help from Bach. That minute or two towards the end gives a brief but tantalising glimpse of Charles Daniels' dramatic potential. It is probably not worth buying the disc just for that short track though, so by way of a conclusion, here are some of the other qualities the disc has to offer. The recorded sound is excellent. Channel Classics and their producer Jared Sachs are famous for the care that goes into the engineering of their recordings, and this one is no exception. The disc doesn't have the fancy packaging that made their recent Matthew Passion such a feast for the eyes as well as the ears. Nor have they indulged in the complex positioning of the choirs in the surround array that made that previous release so interesting, but the audio clear, lively and intimate. Competently translated liner notes are all too rare these days, so it is nice to see all the English makes sense here. An enjoyable Magnificat then, if not the most distinctive or accomplished on the market. There really isn't enough of Charles Daniels on it to justify buying it for him alone. But he is part of an attractive line-up of soloists, and Dorothee Mields and William Towers in particular also put in excellent contributions. So, perhaps when considered as a team, they do justify the purchase after all.